In my second book, The Pensionnat revisited, I wrote there were two Brussels editions of a French translation of Villette. I wrote half a page about them, and the copyright question and other translations. This series of articles is of course a much improved version of that story. What I wrote was not entirely right. It was unfinished research. 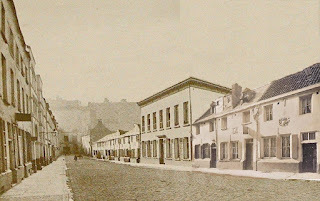 There were, we know now, four ‘Brussels Villettes’ in 1855. 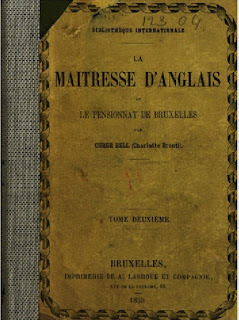 Apart from three book versions, La maîtresse d’Anglais, ou Le Pensionnat de Bruxelles was also published in serialized form, in the Revue Britannique. We’ll begin by describing the four editions. The Revue Britannique was a monthly journal, which was published from 1825 to 1901. It was not just a Belgian journal. It appears that there were two different editions of it on the Continent in 1855. One has Paris, Rotterdam and Madrid as places of publishing, the other one has Brussels and Livorno. for the first half of the year. 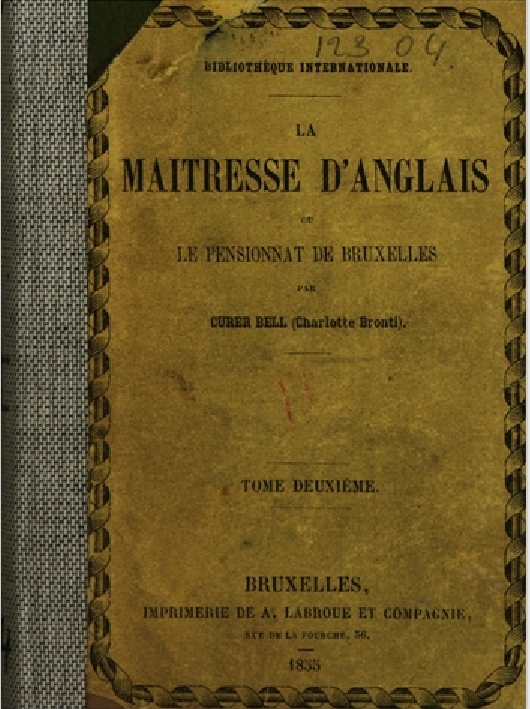 It started to publish La maîtresse d’Anglais in its March edition of 1855, just before Charlotte died and after the Anglo-Belgian copyright treaty. The journal never mentions the author (nor does it mention her death). The ninth and last episode was published in November. It’s easy to see that the opening chapters of the novel were cut short. By the end of the first installment Lucy Snowe had already well and truly arrived in Brussels. If the Hegers hadn’t heard about Villette yet, they would now. At that time the Revue Britannique was “sous la direction de Amédée Pichot,” a historian and translator. It seems likely that he did the translation of Villette. Pichot (1795-1877) translated a lot of works from English authors, including Dickens and Thackeray. He was a Frenchman, which will mean that the origin of La maîtresse lies in France. The page numbers of the installments are: in Part 1 of 1855, March, pp. 345-364, April, pp. 477-492, May, pp. 590-614, June, pp. 714-735; in Part 2 of 1855, July, pp. 81-99, August, pp. 222-239, September, pp. 296-310, October, pp. 419-442 and November, pp. 544-553. The July to November editions of La maitresse can be seen via Google books. Perhaps the most interesting edition is the book, three separate volumes in fact, published by Kiessling & Schnee, of Brussels and Leipzig. Its address in Brussels was Rue Villa-Hermosa 1 (now the Ancien magasin Old England, on the corner with the Montagne de la Cour), in the Isabella Quarter, only a few hundred meters away from the Pensionnat Heger. A copy of this edition is in the possession of the Heger family. It has been directly linked to them finding out about Villette, but this can’t be true. The Revue Britannique Villette at least came first. In her ‘M. Heger’s grand-daughter visits Haworth’ (Brontë Society Transactions, 1953, vol. 12, nr. 3), Phyliis Bentley said that “Mme. Beckers showed us some interesting Brontëana; … and a rare pirated edition of “Villette,” very freely translated into French and dated Brussels, 1855 – only two years after its publication, when Charlotte was still alive.” Gérin’s description of this edition in her Charlotte biography shows that it is the Rue Villa-Hermosa Villette. Bentley’s statement that Charlotte was still alive is wrong. The Journal de l’imprimerie et de la librairie en Belgique has recorded the publication of the three volumes in 1855. The first part was mentioned in the July edition, which will probably mean that it was published in June, or May perhaps. As one would expect this was done at about the same time as the third installment of La maîtresse in Revue Britannique in May 1855, or shortly after. The second volume was mentioned in the October/November edition, while the third volume was announced in the December Journal. The Journal also has the Revue Britannique contents for each month, but not the other two editions of La maîtresse. It did give the name of Currer Bell as the author of the first installment, which as we saw the Revue itself didn’t. The Bayerische Staatsbibliothek has a digital version of the first volume online. In Germany Mainz University Library also has a copy of this La maîtresse. The one other known copy is kept at the National Library of Poland. The Library of the University of Amsterdam has in its collection an edition of La maîtresse d’Anglais which was published by Borrani et Droz from Paris. This name was not printed though on the cover page. A little sticker was put on it. Like the other edition this Villette was also printed by A. Labroue et Compagnie, from Rue de la Fourche 36 in Brussels. All the books make the same strange mistake of giving the author’s name as ‘Curer Bell (Charlotte Bronti).’ The Paris Villette’s three volumes have 216, 206 and 219 pages respectively, and so no doubt will the other editions. These La maîtresses have quite identical advertisements on the back cover, for itself, for the Revue Britannique, and also for instance of a work by “Tackeray,” in the ‘Bibliothèque internationale’ series. Both the first and second volume mention two volumes of itself, while the third gives “3 vols.” This suggests that the first and second volume were published together, presumably in September. Volume two can’t have been published before August at least, the month of the sixth of nine installments in the Revue Britannique. The Ghent University Library has in its collection a Brussels Villette which only has the printer’s name. They only have the second and third volume. Apart from the little Borrani et Droz sticker it’s similar to the Paris Villette. The band of decoration was widened, leaving no space for a sticker beneath it. Volume 2 can be seen here, and volume 3 here. It has also got the Bibliothèque internationale inscription on the cover page. The back cover pages have apparently not survived, so we don’t know if it had the advertisement of the Paris Villette. That is likely though. The text of these four editions is exactly the same. It is just one translation, published in four versions. The print setting of the three books is identical, and it’s even the same as that of the Revue Britannique Villette. Only the cover and title pages vary. There are five known surviving copies of the Rue Villa-Hermosa Villette, and only one of each of the other two book editions. An unspecified copy is being held in a Rio de Janeiro library, and it is possible there will be a few more copies in other libraries and in private collections. There is no sign of a La maîtresse ever having come up for auction. They were cheap copies, of rather poor quality. Some remaining volumes have been bound, surely in a bid to restore a book that was falling apart. Not all front and back cover pages have survived. It was probably cheapest to have it printed in Brussels. That will have been the major reason, rather than the Brussels connection of the novel. Phyllis Bentley, as we saw above, called La maitresse a “very freely translated” work. Perhaps it’s mostly though an abridged version of Villette. We would estimate that almost half of the text has vanished. Whole paragraphs of the original are sometimes condensed into a few lines, but the remaining part is reasonably well translated. The Revue Britannique speaks about its nine installments as ‘extraits.’It could perhaps be called an ‘imitation,’ or an adaptation, for which there was no copyright protection. The copyright treaties were “not intended to prohibit fair imitations,” but were meant to prevent piratical translations. In case of disagreements a court judge would have to decide on whether a work was an imitation or a translation. It is remarkable that it took until March 1855 before the first part of (an abridged edition of) a French Villette was published. Apparently no French publisher was really interested, and no translator stood up earlier. It took until well into the 20th century before another French translation was published. Before writing about the supposed scandal Villette caused in Brussels, against the background of the findings presented here and in the earlier articles, I will first write about the other early translations of Villette, in countries like Germany and Russia. Both had 1853 translations. In the latter country there were two editions of a translation of La maîtresse d’Anglais. *With thanks to Gabriel Swift and Brianna Cregle of Princeton University Library, Department of Rare Books and Special Collections. Je me vengerai, or did Charlotte really say that to Madame Heger? This story obviously goes together with Villette as being Charlotte’s revenge. It’s a great story, but can it be possibly true? Here we present what is known, for the reader to judge. To be clear, there are two separate stories, firstly “the two women traveling together to Ostend” story, and secondly, the “declaration of revenge” story. Harman is the first biographer of Charlotte to combine the two stories. But it appears that Jolien Janzing has the somewhat dubious honour of being the very first in her novel Charlotte Brontë’s secret love, first published in Dutch in 2013 as De meester. The revenge theory goes back to the 19th century, while the origin of the Charlotte and Madame Heger traveling together to Ostend story dates from 1951. These sources do not combine the two stories. The idea that Madame Heger and Charlotte traveled together to Ostend, after her final farewell to Brussels, comes from Mme. Beckers, née Simone Heger. She was a daughter of Madame Heger’s son, Paul. It is found in the Brontë Society Transactions of 1951 (volume 12, nr. 1), in an article called ‘The Hegers. A Brontë luncheon in Brussels for Dr. Phyllis Bentley.’ It says that “Mme. Beckers mentioned that when Charlotte left the Pensionnat Heger finally, Mme. Heger accompanied her to the boat at Ostend.” Mme. Beckers gave more Heger family information, but sadly, much of it is untrue. Why would Madame Heger accompany her all the way? It has been said she wanted to make sure Charlotte really did leave, but she could be certain that Charlotte wouldn’t go hanging around in Brussels. The journey would be very painful for both, and probably cost her a night in an Ostend hotel. We don’t believe this story is true. Madame though may well have escorted her to the coach, or the train, in Brussels. As you see from the quote it doesn’t say which means of transport would have been used. It doesn’t hinder a Charlotte biographer like Rebecca Fraser from stating that they traveled in a “diligence.” It could have been a train too, in which Charlotte at least made her journey to Ostend. We don’t know. It is interesting of course that Harman and all biographers since Margot Peters in 1975 accept this traveling story as a truth, while Harman says she doesn’t believe the theory that Charlotte uttered words of revenge. The others, like Peters, Rebecca Fraser and Lyndall Gordon don’t mention it. And yet, this is at least a more likely story. If true, the only original source can be Madame Heger of course, through one of her daughters probably. It wasn’t Charlotte. The oldest reference dates from 1896. The article was written by A. Colin and was an obituary of Monsieur Heger. It was translated and published in The Sketch, from which comes this quote: “The thought of [going back to Haworth] caused her keen distress. She warned Madame Heger that she would take her revenge, and this threat was soon carried out.” Unfortunately Colin, an editor of the journal l’Etoile Belge, is an unreliable witness. A lot of things in his article are untrue, but that doesn’t mean this was untrue. Brian Bracken has demonstrated how unreliable Spielmann is in his article (Marion Spielmann’s Brontë-Heger Letters History: Fact or Fiction?, in Brontë Studies 38/1 Jan 2013). One very much wonders by whom he ‘was assured.’ We would think Louise Heger is the best candidate. So there are two independent sources for the revenge story. Together they make up a good point. It’s easy to dismiss one, but both is less easy. It is at any rate no wonder that Ellis Chadwick (in 1914, in In the footsteps of the Brontës), spoke of “the vindictive nature of Villette.” And Rebecca Harding-Davis (in 1906) stated that “Villette, in which Charlotte Brontë laid bare her heart to the public, and took deliberate revenge on the wife of the man whom she loved, was undoubtedly a work of genius. But surely the exposure and the revenge were ignoble and paltry” (in my The Pensionnat revisited (PR), p. 58). Charlotte’s portrayal of Madame Beck in the novel can easily be seen in the light of revenge. She knew that before too long the book would get known in Brussels, and that Madame Heger would be deeply hurt by it. We will most probably never find anything more on whether Charlotte said these words, so we must base our opinion on what has been presented here. The possibilities therefore are four-fold; firstly that it’s not true, secondly that Charlotte indeed said these words, and thirdly that she only thought them. A fourth option is that she only had revenge in mind later on, when writing her Brussels novels. Charlotte herself seems to support this theory, obviously. 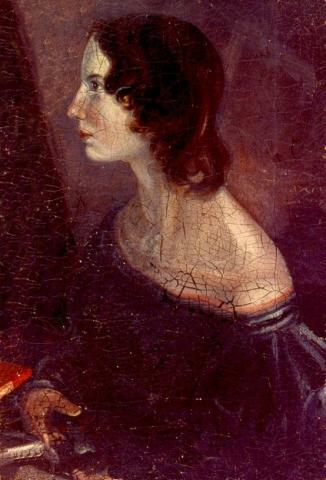 In a letter to Ellen Nussey (who received it on 22 November 1852) she wrote that Villette, “I think, will not be considered pretentious – nor is it of a character to excite hostility” (Smith, vol 3, p. 85). It implies apparently that she deliberately made Madame Beck unlike Madame Heger. And it’s true of course that Madame Heger was much nicer than the novel figure. Frederika Macdonald indeed, in 1894, wrote about “the true Madame Heger, whom I find it impossible to believe the author of Villette ever meant it to be supposed could have sat for the portrait of Madame Beck” (in my Charlotte Brontë’s Promised land (PL), p. 73). She acknowledges though that there was “actual antipathy” in Charlotte’s feelings towards Madame Heger (p. 74). Still, it would also seem then that Charlotte just didn’t think about any hostility the novel would stir in Belgium. She insults the whole country. It’s not easy to believe Charlotte was entirely honest to Ellen. But it may be seen as an argument that she didn’t have revenge in mind. Hostility is something else anyway. The anonymous author of the 1890 article in The World argued that “Charlotte Brontë’s fund of descriptive subjects was necessarily small, and the temptation to make capital out of the Rue d’Isabelle was too strong to be resisted. After taking the first step the rest was easy. The pensionnat, like everything else, had its weak sides, and the more Charlotte Brontë wrote, the more she forgot her ‘undying obligaton’ to her ‘dear friends’ the Hegers. It ended by putting them and all their surroundings into a literary pillory, which will last far longer than the Burgundian dog-kennels or the fame of the crossbowmen“ (PL, p. 68). Brian Bracken, who has been helping me very much with these articles, is inclined to believe that she would have at least thought the words. Claire Harman as we saw also thinks Charlotte thought the words. It would be too crude to say the words indeed, in this theory. That’s what the first two options have in common. I support the idea that Charlotte really said the words. I think Sue Lonoff is right in believing that she either thought or said the words. We have two independent sources for her saying the words, which makes it a credible story. Therefore I can’t really believe in the thought theory. Charlotte on that day felt very depressed. She knew she would never see Monsieur Heger again. In such (I’d say divorce-like) circumstances people can quite easily say crude things. And she hated Madame. Apart from this, women can be that crude to one another when there’s some sort of rivalry. Charlotte’s pen was her weapon. She first tried it by Zoraïde Reuter in The Professor, but that attempt failed, as it didn’t get published. Both she and Madame Beck are “scathing portraits” of Madame Heger, as Clement Shorter (who otherwise staunchly defended Charlotte in everything) put it, in the second chapter of this series. And we all have to admire her revenge, Villette, Charlotte’s masterpiece. Sadly Madame Heger had to be sacrificed for it. It is also possible that Charlotte only felt thoughts of revenge when writing Villette, and not earlier. She may after all well have had no such an idea in mind almost ten years earlier. This theory is quite closely related to the first option, in that it does not believe that Charlotte thought such things, let alone uttered them, when the two women parted. Her feelings of vengeance may only have developed when she began to see the hopelessness of her correspondence with Monsieur Heger. She will have blamed Madame for not receiving a letter anymore, from him. And presumably quite rightly so. Zoë Heger will have discouraged her husband from writing. When it really became clear that he would never write anymore Charlotte started writing The Professor. In this novel the Isabella Quarter is not disguised at all. The portrait of Madame Heger as Zoraïde Reuter can be seen as vindictive, and surely her later creation too, Madame Beck. This last theory is also related to the second and third option of course. Both too accept the idea that Villette was a novel of revenge. The main question probably is whether or not to accept it was. The next choice is if she had such an idea when the two women parted, and then whether or not she may have said those words, or only thought them. What do you, the reader, think? We are very interested in that. You can cast your vote below. These articles also go to show how difficult it is to find real concrete evidence for things claimed by past Brontë historians, and that quite often what they claim is found to be untrue, on closer inspection. Preventing a French Villette, or did Charlotte really try? There’s nothing to suggest Charlotte Brontë did indeed implore Smith, Elder & Co to prevent a French translation, as Gérin said. Many letters she wrote to them have survived, and there’s nothing in them, or in any other letter she wrote, to suggest she did, or even that she was bothered by the question of the novel becoming known in Brussels. This doesn’t of course prove Charlotte didn’t try what she could. At some point she might have told George Smith personally about the Brussels origin, and might have asked him. 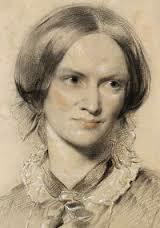 In a letter to a John Forster, of 3 May 1853 (in M. Smith ed.- The letters of Charlotte Brontë,vol. 3, p. 160) Mrs. Gaskell wrote that “Mr Smith has got her 100 £ for a ‘French’ translation of Villette (500 £ for the copyright)…) but Tauchnitz, or his agent Williams, have never applied to her about Leipsic [sic] re-publication.” Mrs Gaskell here implies of course that Charlotte gave permission for a French translation. It doesn’t show that she indeed gave permission for a French translation, as Mrs. Gaskell suggests, and it keeps open the possibility that she used the copyright treaty between France and Britain to prevent a France translation, for a year. International copyright and Villette, or could Charlotte prevent a French translation? “How much George Smith had to be initiated into the secret shrouding of the Brussels origin of the book can only be guessed from the fact that Charlotte pledged him to refuse and to prevent a French translation. He kept his word till after her death, but it was of little avail to check the pirates,” Winifred Gérin wrote in her biography of Charlotte Brontë. In her biography of Mrs. Gaskell she writes that Charlotte “had made a special agreement with George Smith.” It is a widely held belief that Charlotte did her best to prevent a French translation, but did she really? And just as important, what could George Smith have done? This article deals with the latter question. Gérin gave no source but she was at least partly inspired by Clement Shorter, by what he wrote in his Charlotte Brontë and her Circle (London, 1896). She must certainly have seen this book. "But,” Shorter wrote, “in justice to the creator of these scathing portraits [of Madame Heger in The Professor and Villette], it may be mentioned that Charlotte Brontë took every precaution to prevent Villette from obtaining currency in the city which inspired it. She told Miss Wheelwright, with whom naturally, on her visits to London, she often discussed the Brussels life, that she had received a promise that there should be no translation, and that the book would never appear in the French language. One cannot therefore fix upon Charlotte Brontë any responsibility that immediately after her death the novel appeared in the only tongue understood by Madame Heger."